I always love the look of ivy covered walls, but I think the bottle lamp makes this little space even prettier. Found this place after having lunch with my friend at The Camp in Costa Mesa and took a quick shots. Wearing a cozy top I bought in japan (again?) and love the fact it has pockets. It reminds me a hoodie but without a hood..
wow really nice post dear. the bottle lamp. so crative! giveaway. please have a look. love the pleated skirt with the cool grey jersey! As usual the decor behind you is perfect! The bottle lamp is such a cute idea. Love your pleated skirt! tnx you so much for your comment. You have a pretty cool blog :) love your skirt. The bottle lamp is so unique! I love your pleated skirt too. very very cute! i love sweater and pleated skirt combo. What a fun lamp! :) A Helsinkian hello! I’m so in love with your outfit, it’s really simple I know but I love the combination of these fabriks, the sweater is really nice and goes perfect with the skir, and of course this ankle boots, love them! very beautiful look! the match is awesome!!! that lamp is so cute! i couldnt ake my eyes off it! 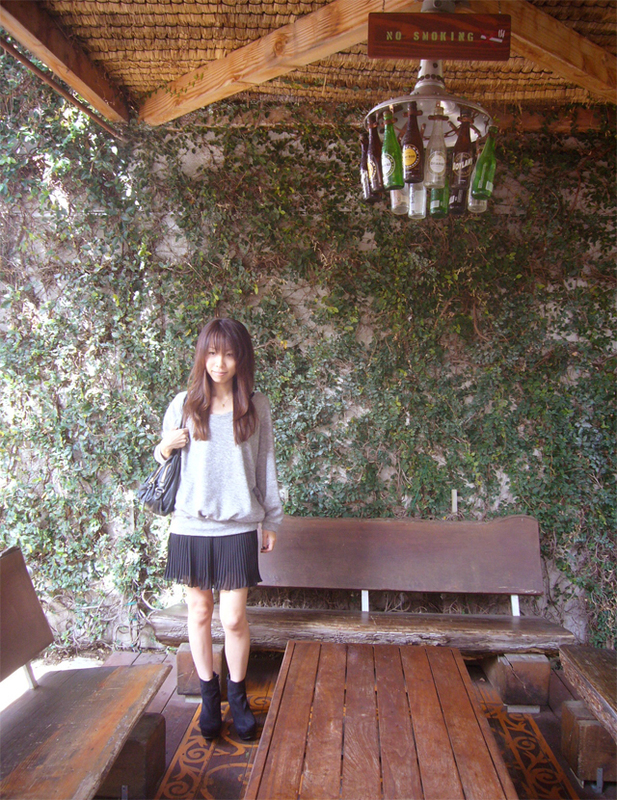 Love your cozy sweater and that bottle lamp is amazing!!! i like the skirt with the sweater so much. The bottle lamp is such a great idea, i love the place. i love the little skirt!